The fuchsia color of these round and pear cut rhinestones is not only vibrant but also uncommon. 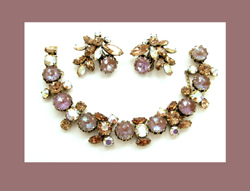 The lively pink along with crystal on this DeLizza and Elster parure creates a dazzling display. 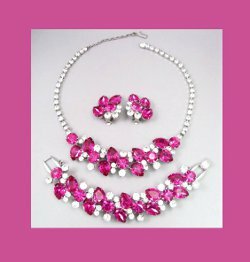 All the sparkling rhinestones are held in a splendid silver tone setting. The chain extender has been added for additional length but could be removed to restore to the original condition. Matching pin also available. 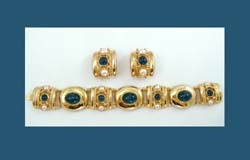 Dark sapphire blue glass cabochons with white whisps decorate this stunning bracelet and earring set from Joan Rivers. With a golden setting, these cabochons create a bold display with plastic pearls as their partners. 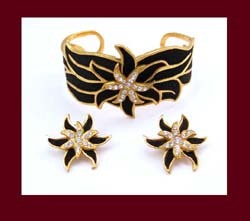 Rhinestones sparkle from the center of this lovely cuff and earring set from Henry á la Pensée. Jet black suede covers the recesses in a golden setting. Perfect hearts for a perfect sweetheart. 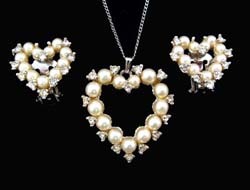 Bogoff has delightfully arranged small glass pearls into hearts on each earring and pendant. Small round rhinestones skip between each pearl in a silver tone setting. 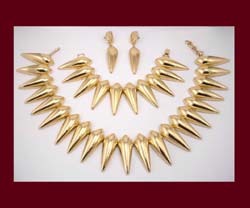 With an elegant and captivating design, gold and silver tones cover this Napier necklace and earrings set. The necklace has a comfortable gas-pipe chain that leads to a large tear drop pendant. 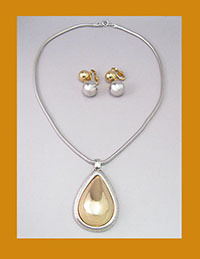 The matching earrings are a combination of silver and gold tone spheres. 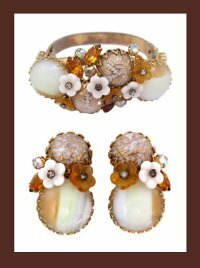 An interesting combination of molded glass flowers, rhinestones and decorative glass cabochons adorn this bracelet and matching earrings. White and caramel streaked cabochons along with white cabochons with golden leaf details are surrounded by glass flowers and rhinestone leaves. These elements are all held together and displayed on a golden setting. 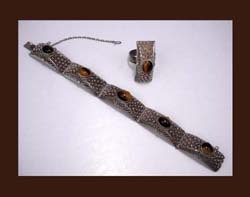 This fabulous sterling silver set of earrings and bracelet are from Germany. A different and interesting Egyptian picture is carved in each section. 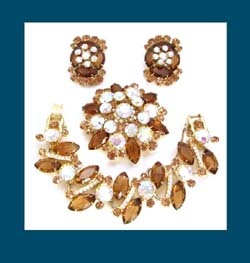 These earrings and bracelet from Regency are a collage of shimmering beauties. Large round saphiret rhinestones glisten with a mixture of mauve and blue colors. The accompanying rhinestones are the always brilliant aurora borealis and topaz rhinestones. Playfully combined, blue, pink, and green glass "cookies" are on a white enamel background on this stunning set by Kay Denning. The pink is slightly iridescent and the emerald green is beautifully translucent. 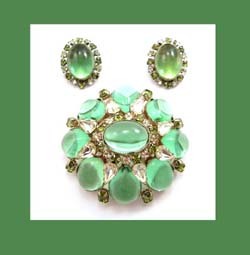 Beautiful and pristine peridot green glistens from these Schreiner pin and earrings. Each earring is framed by alternating round citrine and olivine rhinestones in a golden tone setting. This amazing set from Juliana (a.k.a. DeLizza and Elster) has the sparkle and pizzazz of big city lights. Topaz marquise rhinestones are perfectly combined with large and small aurora borealis rhinestones. Lighter topaz round rhinestones decorate each piece. Bright and cheery colors beam off these earrings and pin. 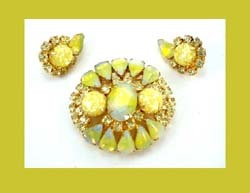 The center rhinestone and the surrounding tear drop cabochons are a milky white with yellow. Confetti Lucite rounds sit to the side on the pin and center of the earrings. Small sparkling citrine rhinestones dance around. The workmanship on this set is truly amazing. 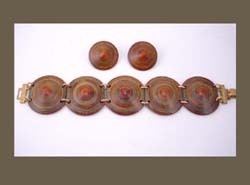 Each disk is convex in shape with alternating circles of a rich chestnut color and pine green. 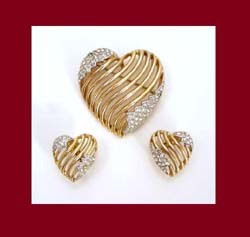 This is a fantastic set of golden hearts. This pair of earrings and pin have waves of golden lines through the center. Small glistening rhinestones group together off center at the top and bottom. A stunning bracelet & earrings set with marbled plastic aqua cabochons surrounded by imitation pearls set in a silver tone metal. Stunning and sleek design in gilt metal. 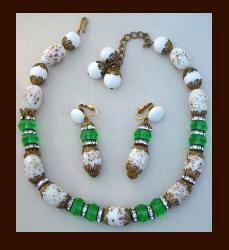 Set consists of matching necklace, bracelet, and earrings. Gorgeous earrings and necklace strung with white beads with golden speckles, accented by green crystal beads and rhinestone rondelles. 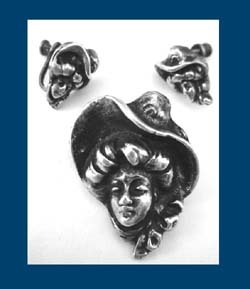 Matching pin and earrings depicting a beautiful woman wearing a bonnet secured with a bow and billowing hair beneath. 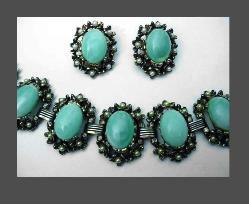 Tigereye cabochons set in silver adorned with cannetille decoration.